Multi-sector stocks in the equity market have been gaining strength, of late, on the back of escalating demand for air travel, technological upgrade in manufacturing processes, as well as improving operations in the oil and gas industry. Going forward, reduced corporate-tax rates, steaming-up industrial activity in the United States, and increased government spending will likely continue to benefit these companies. Such multi-sector stocks are grouped under the Zacks Conglomerates sector that currently occupies the fourth position among the 16 Zacks sectors. Earnings for the sector are anticipated to be up 2% year over year in 2018, aided by around 4% annualized top-line increment. 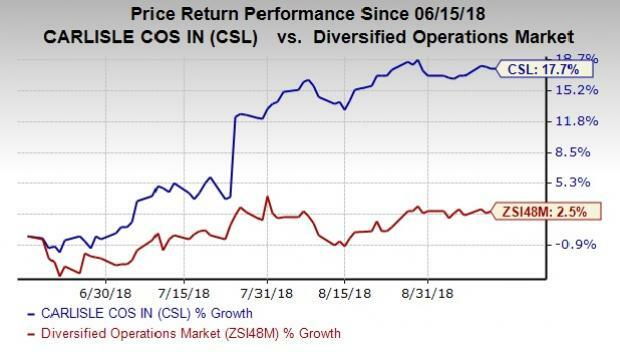 Among the numerous potential gainers within the sector, addingCarlisle Companies Incorporated CSL to your portfolio will be a promising investment move at the moment. This stock currently carries a Zacks Rank #2 (Buy). Vision 2025: In 2017 Carlisle rolled out a strategic Vision 2025, to deploy $3 billion over above-market organic growth, synergistic acquisitions, and its Carlisle Operating System (COS) culture. Under this regime, the company seeks to generate revenues by $8 billion, procure 15% returns on invested capital and secure 20% growth in operating income by the end of 2025. Over the past three months, Carlisle’s shares have rallied 17.7%, outperforming 2.5% growth recorded by the industry. Diversified Business Structure:Carlisle has been gaining from its diversified business structure, which enables it to tap advanced opportunities and neutralize operating risks associated with a single market. For instance, robust growth in U.S. commercial construction market will likely continue to strengthen Carlisle’s Construction Materials segment’s performance. On the other hand, growth in SatCom and Aerospace market demand will likely boost Carlisle’s Interconnect Technologies segment’s performance in the quarters ahead. Per our estimates, the company’s year over year revenue growth is currently pegged at 10.4% and 5% for 2018 and 2019, respectively. Profitability: Carlisle pulled off an average positive earnings surprise of 12.85%, over the last four quarters. The company’s adjusted earnings in second-quarter 2018 surpassed the Zacks Consensus Estimate by 18.7% and also came in 25.5% higher than the year-ago tally. Carlisle believes stronger end-market demand, implementation of COS and its price-realization efforts will enhance profitability in the quarters ahead. Per our estimates, the company’s year over year earnings growth is currently pegged at 10.3% and 16.8% for 2018 and 2019, respectively. Strong Liquidity: Carlisle’s strong liquidity position adds to its strength. As of Jun 30, 2018, the company recorded cash and equivalents of $762.4 million compared with $136.1 million reported a year ago. Also, as of June 30, 2018, availability of the company’s cash in hand was $1 billion under its revolving credit facility. Furthermore, the company remains highly committed toward increasing wealth of its shareholders through dividend and share repurchase programs. In this regard, during the June-end quarter, the company repurchased approximately $111 million of its common stock and deployed around $23 million to pay dividends. Acquisition Story: Since 2008, Carlisle has deployed almost $3.4 billion for mergers and acquisitions. Out of this, $1 billion was allocated to four acquisitions in 2017 — San Jamar, Arbo, Drexel Metals and Accella Performance Materials. In the April-June quarter, these acquisitions boosted Carlisle’s top-line performance by 14.3%. Going forward, the companyintends to make fresh business buyouts for its aerospace and med-tech businesses. Strategic acquisitions will likely continue to bolster its revenues, moving ahead. Federal Signal Corporation FSS sports a Zacks Rank of 1 (Strong Buy). The company pulled off an average positive earnings surprise of 22.48% over the last four quarters. You can see the complete list of today’s Zacks #1 Rank stocks here. Macquarie Infrastructure Company MIC holds a Zacks Rank #2. The company delivered an average positive earnings surprise of 8.05% over the trailing four quarters. Crane Company (CR) also carries a Zacks Rank of 2. The company generated an average positive earnings surprise of 3.03% during the same time frame.